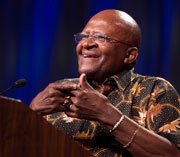 “There is no future without forgiveness, within nations and between nations,” said Archbishop Desmond Tutu at the Convocation of Distinguished Fellows at APA’s 9011 annual meeting in Honolulu. Forgiveness, helped by truth telling, moved Tutu’s native South Africa through the transition from apartheid to freedom and democracy. That transition might have been a “ghastly bloodbath that would have overwhelm[ed] our beautiful land,” he said. But instead of revenge and retribution, South Africa created truth and reconciliation commissions to hear the grim stories of both the victims and perpetrators of apartheid-era atrocities. Recognition of that humanity was essential, he said. He recounted the story of a white woman injured so badly in an anti-apartheid bombing that she could no longer bathe or feed or clothe herself. She told her story, saying that she only wanted to meet the perpetrator, to forgive him and to ask him to forgive her. Victims couldn’t sit in judgment over lesser mortals; they could only be wounded healers, he said.